Previously on Impact: Last week on Impact, Bobby Lashley defeated Mike Bennett to retain the TNA World Heavyweight Championship. Moose refused to help Bennett win and knocked him out with a vicious clothesline after the match. 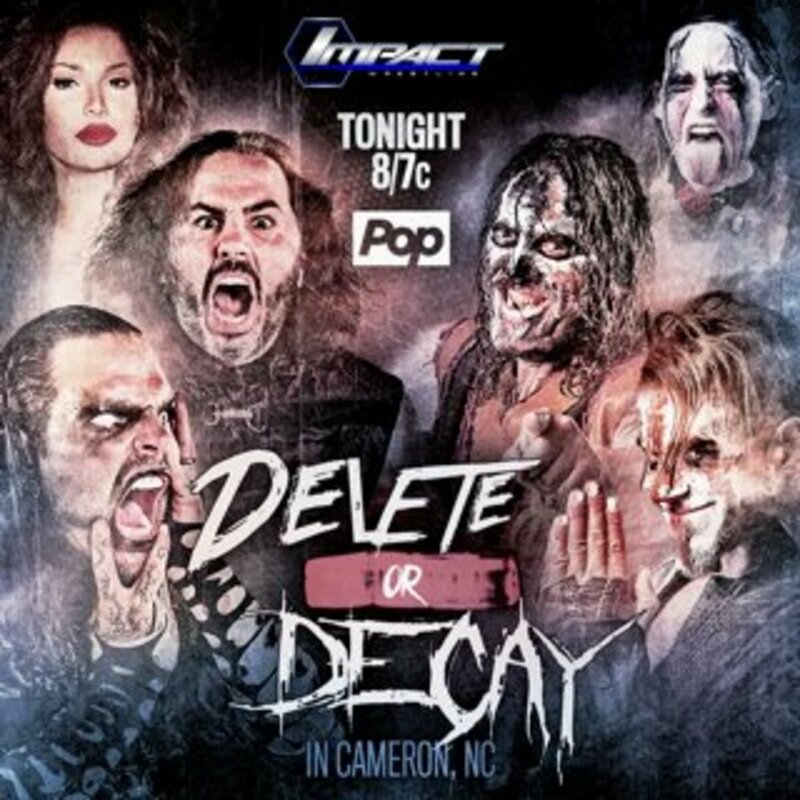 Tonight on Impact: In tonight’s main event, The Hardys will battle Decay at the Hardy compound in North Carolina in “Delete or Decay." This match is similar to The Final Deletion spectacle from a few months ago. Also, TNA president Billy Corgan makes a huge announcement, and there will be footage from a press conference featuring Ethan Carter III and Lashley. - Impact starts with Senor Benjamin reading a disclaimer in Spanish for tonight’s main event. Vanguard 1 informs us that no animals were harmed in the documentation of the invasion. Next, we get an opera version of “Obsolete” while Senor Benjamin digs three graves for Decay. Broken Matt, Jeff, Reby, Maxel, and Benjamin will go to the zoo so they can get in touch with their instincts. - In the Impact Zone, Mike Bennett and Knockouts Champion Maria make their way to the ring. Bennett fired Moose in a text message and said he can now focus on becoming TNA World Champion. Dixie Carter came out and announced that Moose will face Bennett at Bound for Glory. Moose came out and set Bennett up for the Go To Hell, but Maria distracted him and Bennett escaped. In the back, Bennett and Maria demanded Dixie call off the match. Dixie says that if she calls it off, Bennett will be in breach of contract. Dixie stripped Maria of her power as leader of the Knockouts because she can't be the division's leader while being Knockouts Champion. Sienna bullied Allie and wouldn't tag her in. The finish came when Allie made a blind tag and accidently hit Sienna. Sienna hit Allie with the Silencer and left. Jade reluctantly pinned Allie to win the match. After the match, Jade and Gail felt bad for Allie and helped her up. - Jeremy Borash interviewed TNA president Billy Corgan. Corgan has a huge announcement that he says will change wrestling. - We join The Hardy Family at the zoo. Matt got some valuable advice from the first President George Washington. It was actually a giraffe. Matt and George Washington the giraffe had incredible chemistry. Jeff and Matt sparred with “Smokin' Joe Frazier,” which was a kangaroo. They legitimately sparred with the animal. Next, Matt and Jeff watched a cage of monkeys hanging around. Matt claimed to be a spot monkey whisperer. He introduced the monkeys as DJ Z, Andrew Everett, and Mandrews. Matt called the last two monkeys, Nick and Matt, the Bucks of Youth. Matt spoke to his pet tiger, Genghis Khan, who informed him that Decay were on their way to the Hardy compound. - Corgan came to the ring. He's retiring the King of the Mountain title and announced the new TNA Grand Championship. Drew Galloway came out and said he should be champion. Corgan said it would be an evolution and a new type of match. We got a video explaining the rules for the Grand Championship. Each match consists of three 3-minute rounds, and they can end by pinfall or submission. Each match will also have judges using a 10-point scoring system. If the match ends in a draw, its goes to the judges for a decision. An 8-man single elimination tournament to determine the first Grand Champion will start tonight. The first champion will be crowned at Bound for Glory. Aron Rex came out and wanted to fight Galloway. Corgan informed them that both will be in the tournament to crown a new champion. Galloway's first round match is next. The judges were around ringside for the match. Josh Matthews explained that the judges are scoring based on aggressiveness, controlling the match, and physicality. At the end of round one, the judges score it 10-9 in Galloway's favor. Sutter gained the advantage at the end of round two and the judges gave him the round. Seconds later, Galloway made Sutter tap out in round three to win and advance in the Grand Championship tournament. - During the break, Rockstar Spud attacked Sutter after his match. - A man drove down a dark and lonely road listening to his favorite country song. He saw Rosemary walking in the distance. He pulled over and flirted with her, then Abyss and Crazzy Steve appeared and attacked. Decay drove away towards Cameron, NC. The man was left face down on the road with his pants pulled down to his ankles. The press conference took place earlier at the Impact Zone in front of a VIP audience. Corgan sat in between EC3 and Lashley at a table. Corgan said there are going to be changes under his new leadership. Both EC3 and Lashley got a chance to speak their mind. They went face-to-face and eventually brawled all over the empty Impact Zone. They fought in the stands, in the entrance way for the fans, and outside in the back. Lashley threw EC3 into a pile of wood to end the brawl. - In the back, Jade finds Allie crying alone. Allie feels she let Maria down and everything is all her fault. Jade is shocked and calls her crazy. At the end of the first round, two judges score it in the favor of Godderz. Drake survived round two, but the judges gave the round to Godderz as well. With less than a minute left, Drake hit the Blunt Force Trauma to pick up the win by pinfall. Drake advances in the Grand Championship tournament. - Decay arrived at the Hardy compound. There was no commentary during the match. Matt, Jeff, and Reby attacked Decay with fireworks. Matt sent Reby back to the house to protect Maxel. Decay hid behind the dilapidated boat. Abyss sent Rosemary and Steve to the house. Jeff dropkicked the boat and sent Abyss into the lake, and Joseph Parks emerged from it. Benjamin knocked him out, took him away, and tried to bury him. Jeff fought Steve in a pool while Abyss returned and attacked Benjamin. Matt stalked Rosemary until Abyss showed up with Janice. Abyss went to hit Matt, but Jeff sacrificed himself and was hit by Janice instead. Abyss and Steve cornered Matt, but Vanguard 1 made the save setting the whole field on fire. At the house, Reby was knocked out on the ground. Rosemary tried to escape with Maxel but Vanguard 1 stopped her. She spit the mist into Vanguard 1, sending it offline. Matt showed up and Rosemary spit the mist at him. Matt sucked the mist up and spit it into Rosemary’s face and she ran off. Maxel was reunited with his parents. Senor Benjamin laid unconscious in the back of the truck. Crazzy Steve and Abyss abducted Benjamin and drove off. Next week on Impact: Round one of the Grand Championship tournament continues when Aron Rex debuts against Trevor Lee, and Eddie Edwards faces off with Mahabali Shera. Also, the number one contender for Maria’s Knockouts title will be determined.